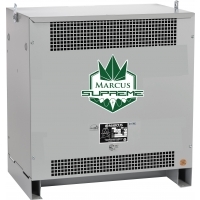 Marcus Supreme generates a minimum of 33% less losses than the regulated standards (CSA C802.2 and NEMA TP-1) mandate and meets the most severe efficiency levels of the recommended DOE CSL-3. This translates into significant dollar savings for both rrtrofit and new installations. The replacement of an older, non-compliant transformer with a Marcus SupremeTM will result in savings in the total life cycle of the installations. Choosing a Marcus SupremeTM over a new compliant transformer is the right decision. Example: A 225KVA transformer Marcus MHE225A2 Supreme loaded at 75% will save $1557 a year and $46,710 over the 30 year life cycle of the transformer.